Did you catch the rumor circulating last week about the supposed iPad Maxi? I did, but thanks to being between a couple conferences I didn't get a chance to properly debunk it. This rumor is bunk, of course. According to an unsubstantiated report on the Korean language site ETNews.com, Apple is rumored to be talking to screen manufacturers about placing an order for a large quantity of 12.9" screens. Sources also claim that this screen is destined for Apple's new iPad Maxi, and that Apple is planning to release this iPad Maxi in 2014. I know I'm 5 days late on this story, but I was reading the coverage today and I went through 6 stories that disbelieved the rumor but didn't actually offer a good explanation for why it was bunk. It's pretty simple, actually: Apple already has an iPad Max. There already is an iPad Maxi. It's called the Modbook Pro, and it is made with the implicit approval of Apple. It has a 13.3" screen, runs OSX 10.8, and costs $3200 and up. I know it might sound strange for a $3200 tablet to be used to debunk a rumor about the iPad, but bear with me. The first thing I realized about a 12.9" tablet is that the screen size alone is enough to move it out of the "laptop accessory" category and into the "laptop alternative". Trying to shove a 12" tablet and a 12" laptop into a single bag would be kinda awkward, so users are going to want to carry one or the other. Also, by the time you add enough battery life to support that 12.9" screen you already have a rather hefty device, so you might as well go all the way and give the tablet a more powerful CPU as well as the ability to run a full OS, not a mobile OS like iOS (which runs on the iPad and iPhone). I would agree that this tablet is worth making, but that's my point. Someone already is making the tablet: Axiotron. They have been taking Macbooks and turning them into Modbook tablets since 2007, and for all that time they have been an unofficial partner to Apple. The current Modbook Pro starts at $3200, and it runs OSX on a 2.5GHz dual-core Intel Core i5. It also has a pressure sensitive touchscreen. I really don't see Apple undercutting one of their partners by releasing a competing product - not unless there is a really good reason for it. Given that the Modbook Pro is a high-end tablet with hardware that is on par with Apple's laptops, I don't see Apple would want to replace it. Update: A reader has pointed out that I was mistaken in believing that Axiotron was Apple's partner. The tablet maker has been around since 2007, but they've never been an acknowledged partner; instead Axiotron has merely continued to operate without visible disapproval from Apple. 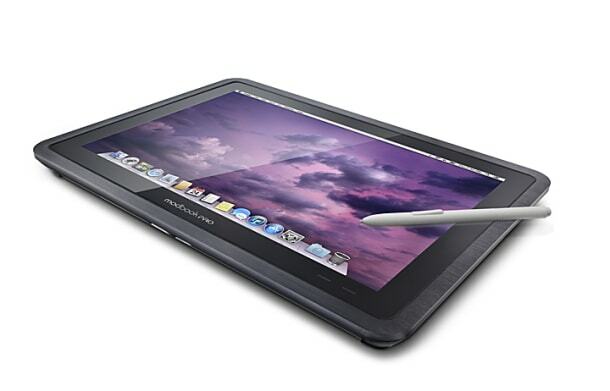 In spite of that I still think that Apple won't see a need to replace the Modbook with their own tablet. And given Apple's past behavior towards accessory makers I think Axiotron has Apple's approval. And even if they did, I bet Apple would go for the 13.3" screen that Apple currently uses on their laptops. Actually, it says right on the Modbook site that they are not endorsed by or affiliated with Apple. I think they’re modifying macbooks as an aftermarket mod, just like Colorware. Since they say (in tiny letters) on the site that they aren’t affiliated with Apple, I’d assume you have zero warranty or aftermarket support from anyone other than Modbook. Apple doesn’t bother to stop them (and I’m not clear on the legality of whether they could), but that’s a far cry from endorsing them or bringing them on as partners. Damn. Where did I get the impression that they were a partner? Probably because they’ve existed for years and didn’t get shut down by Apple legal? They don’t make it super clear that they aren’t affiliated. It’s in tiny letters. I am surprised they’ve never gotten slammed for the “modbook” label, since that looks super similar to macbook. Yeah, the fact that Apple has allowed them to keep using Modbook almost qualifies as tacit approval. And I could be wrong, but I had thought that Apple was at least providing some support to Axiotron’s engineers. Otherwise the latest design might not have come out so well. And crazier things have happened…I agree there’s some weird tacit approval going on there. It could be that Apple feels as long as Modbook satisfies themselves with the small niche of artists who want a touchscreen Mac, they won’t bother to go after them.